‘BIG JIM’ HOLTON was a cult hero for Manchester United and Scotland during the heady early 1970s. 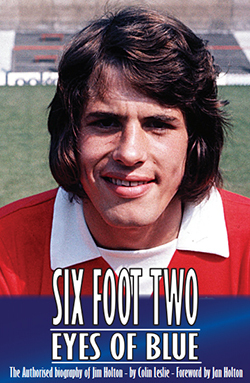 Although he had the terrace anthem ‘Six Foot Two, Eyes of Blue’ bestowed on him by fans of both club and country, his eyes were the deepest brown and it is debatable whether indeed he was even 6ft 2in. As Manchester United declined from the pinnacle of being European Champions in 1968, one of the few silver linings was provided by the no-nonsense Scot and his physical approach to the game. Dismissed by critics as a ‘human grappling hook’ and a ‘hammer thrower’, his class eventually shone through and he played a key role in taking Scotland to the 1974 World Cup in West Germany, scoring in the decisive game against Czechoslovakia at a raucous Hampden Park. Cast off by West Brom as an apprentice, Jim was mentored by the great Harry Gregg at Shrewsbury Town, before he was catapulted into the big time when new Manchester United manager Tommy Docherty took him to Old Trafford in January 1973. Within two whirlwind months of his arrival, Jim had scored twice, been sent off twice, knocked Newcastle’s ‘Supermac’ out cold, and earned his first international cap. United were in a relegation dogfight, but Holton soon helped the club to beat the drop – his combative displays earning him star status among the Stretford Enders. He also shone in a Scotland shirt during arguably their strongest ever era, alongside the likes of Denis Law, Kenny Dalglish, Billy Bremner and Peter Lorimer – a depth of world class talent the country has not been able to call on since. In Germany the Scots were, as usual, unfortunate, going out at the group stage despite remaining unbeaten. Back home, Big Jim was soon back in action, but he failed to stop United from tumbling into the Second Division, a broken leg at Sheffield Wednesday cruelly cutting his season short. It would be his last ever game for United, as The Doc changed the team’s shape on the way to United winning the Second Division championship and back-to-back FA Cup finals. After a spell in the NASL with Miami Toros, Jim returned to English football in 1976 first with Sunderland, then with Coventry City, where he became a crowd favourite once more, featuring in the club’s annual Houdini act as they escaped the drop in controversial circumstances at the end of that season. After nearly 100 games with the Sky Blues, Jim returned to America with Detroit Express and was selected to play for an All-Star team in Franz Beckenbauer’s final competitive match. Upon retirement, Jim became a publican and, alongside wife Jan, they ran several successful pubs in the Coventry area. United supporters would regularly pay Jim a visit whenever the team were in town. Jim always kept himself fit, which made it all the more shocking when he died of a heart attack while out jogging in 1993. He was just 42 years old. Colin Leslie is former Sports Editor at The Scotsman. He has been a print journalist for more than 20 years. He authored the biography of Jim Holton's Scotland team-mate Erich Schaedler who also died tragically early. He has also collaborated with Wales 1958 World Cup star Mel Charles and legendary goalkeeper John Burridge in producing their autobiographies. Colin lives and works in Edinburgh, the city of his birth, and has a son and daughter.